Drawing from the insights of our most knowledgeable professional school counselors and counselor educators, this book lays out in clear and specific detail what school counselors need to do to meet the needs of today's K-12 students. Eminently practical and useful for school counselors and counselor educators alike, each chapter provides exercises and discussion questions to help readers acquire future-oriented insights and skills they can put to immediate use. 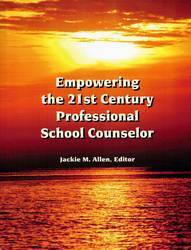 School counselors in the 21st century continue to be on the front lines of educational change. With the growing number of dropouts, tight budgets, national legislation setting the bar for academic success, the growing emotional and social issues young people face, career and employment concerns, and the every day challenge of providing efficacious school counseling services and programs, school counselors seek empowerment for their lives and their jobs. This book has been designed to provide all those who read it, whether in school counseling class or in their office or home, a resource on current topics in school counseling that will empower school counselors with knowledge, practices, and personal development tips to serve the young people in our schools throughout the nation. This book is unique in that teams of counselor educators and practicing school counselors were invited to submit chapters on current topics. This collaboration gave experiential credibility to the chapters.